Recently, we announced our latest product, Instant Chime for Microsoft Lync. 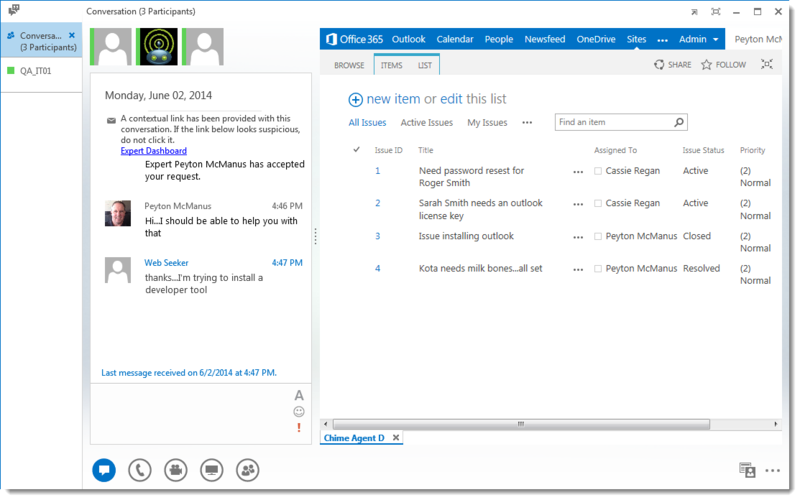 Instant Chime is focused on providing 'click to chat' and service desk support using Microsoft Lync. Chime is the latest offering from Instant that targets the IT and help desk environments - using IM as the primary tool to immediately connect with a help desk agent. Instant has been helping customers with their help desk operations on the IBM Sametime platform for over 10 years. Given this breadth of experience combined with growing expertise on the development team, we have decided to introduce a solution for the Microsoft Lync environment. One global IT customer currently handles more than 30,000 requests per month through Instant Queue Manager for IBM Sametime. At Instant, developing IM based service desk solutions are a core piece of our business and we understand the challenges and needs in this area well. Instant Chime enables agents to handle multiple concurrent chat sessions with case escalation and active dashboards. Chime is singularly focused on the user experience—bringing together multiple role-based dashboards with robust reporting and rich visuals, enabling agents to perform their job with ease and managers to continuously monitor and improved work flow operations. Chime is designed for businesses looking for a more integrated solution to get the most value out of their Lync investment without taking on a full featured contact center deployment.